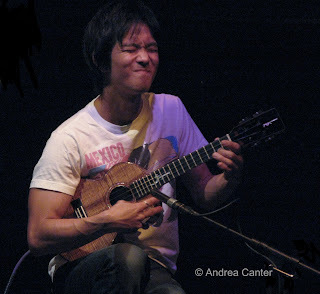 After listening to Jake Shimabukaro’s 2007 release, Gently Weeps, I was sure there were some overdubs. It was hard enough to figure how such an array of sound could be generated by the little ukulele. Surely the 12 “solo” tunes included some self-dubs, at least a bass track here and there. I was sure I heard a third hand at work. No, said his publicist Michael Bloom, this is just Jake alone. And now I know because I have seen Jake at the Dakota. Just Jake. And like any other mortal, he really has only two hands and ten fingers. But that seems to be where such a mundane comparison ends. I have not seen his PET scan so I can not verify my hunch that Jake’s brain works very differently from mine, but I know what I saw and what I heard, and it is beyond genius. And I have witnesses—the Dakota was sold out. Not just the club, but the entire space, dining room and mezzanine. Not a common occurrence on a Sunday night. Not when the performer has yet to attain “household name” status in this part of the world. Not when the performer is a 30-year-old whose chosen instrument normally elicits smiles, giggles, or dismissive gestures. Jake has attained star status in Japan and in his native Hawaii, and is developing a loyal following on the West Coast. Obviously, that trend is evolving quickly in the Midwest. And why not? Not only is Jake Shimabukaro an amazing talent on a unique instrument, he is also one of the most charming performers you will meet. His engaging interaction with his audience only encourages rapt attention to the music, and tonight’s audience was one of the most attentive in months—thankfully, as much of Jake’s music these days is acoustically driven, often delicate, and far ranging dynamically, from raw string power to ethereal grace. His tours with Bela Fleck and Jimmy Buffett notwithstanding, Jake’s solo efforts bring dignity to the instrument and clarify what a true virtuoso can do with it—just about anything he wants. I fear I might overuse the word “exquisite” here, as it describes much of the evening’s first set, as well as Jake’s just-released EP recording, In My Life, and his most recent full-length CD, Gently Weeps: An elegant, self-generated counterpoint on “Misty,” a solemnly majestic “Ave Maria,” the beautifully executed cover of George Harrison’s “While My Guitar Gently Weeps,” and the Far East flavorings of Jake’s “Dragon,” a tune inspired by actor Bruce Lee. Delicacy was not a constant, however, as Jake’s range emotionally, rhythmically, and dynamically wanders far and wide, sometimes within the same tune. His variety of techniques is similarly diverse, including damping the strings to allow the small hollow-bodied ax to be transformed into a booming drum. On his “Wes on Four” (inspired by Wes Montgomery), he grazed the strings at warp speed. Chick Corea’s “Spain” at a fast tempo and “Gently Weeps” at a slower pace most challenged the notion that Jake has but one brain—surely one set of impulses controls the right thumb, another mind altogether manages the remaining fingers, the coordination appearing totally independent, and this does not even take the left hand into account. Somehow with one hand, Jake creates bassline counterpoint as well as chord progressions. 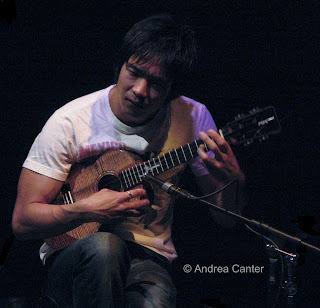 What Jake described as “ukulele bluegrass” (his original, “Orange World”) demonstrated even further the elasticity of hands that were able to weave such intricate patterns from one end of the neck to the other within such a small space, humorously quoting “Deliverance” along the way. At 30 or so, Jake grew up on the pop music of the 80s and 90s, although he reaches back another decade or two for some of his inspiration, particularly to the tunes of the Beatles, which Jake told the audience “use every tool in music.” And through Jake’s ukulele, I felt I was being reintroduced to the music that shaped several generations, including Lennon and McCartney’s “In My Life” and Cyndi Lauper’s “Time After Time,” tunes that gently exploded with emotion through Jake’s seamless display of variable dynamics. After about 75 minutes, Jake left the stage to rest up for the late set. I felt the need to rest up as well, from an often-breathless display of virtuosity tempered with charm and passion, presented by a young man who makes the tiniest instrument sing and dance like the largest symphony.